Active Listening is often reduced from a method of learning to a technique for success in business and diplomacy. Psychology textbooks teach active listening as a tool for diagnosing patients. More than one popular “success in business” text blithely offers this method as a skill. However, in the Eastern understanding of active listening, the Chinese character for the phenomenon captures the complexity that the West so often dismisses as mere technique or skill. The symbol above is a sophisticated combination of characters. The senses of the eyes and the ears are both employed as the mind focuses and the heart analyses the conversation. 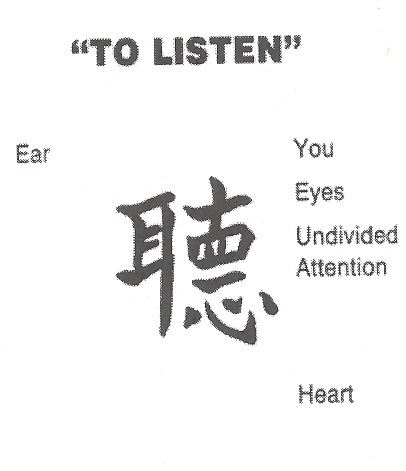 The U.S. Department of State teaches this Chinese lesson explaining that to listen, the diplomat must use both ears, watch and maintain eye contact, give undivided attention and be empathic. Ideally one is listening to a monologue more than participating in a back and forth. When I am conducting a eulogy interview, I ask an open ended question such as “Tell me about your loved one,” which is the colloquially correct way to ask, “Teach me about your loved one.” The words may issue forth in a monotone but the face and the body will often with emotion, whether it is a furrowed brow of pain or gesticulating arms of excitement. This type of learning may also be the most ancient, the oral tradition of passing down knowledge. Unlike all the other forms of learning, this form is first and foremost aural. Learning is comprehending words spoken and words not spoken; silence has the power to teach in this method. The absence of words, the people, events, and issues not mentioned are powerful lessons. The point about active listening is that it is not about you, the listener. Active listening is not a conversation after all; it is receiving, organizing and analyzing. When I start a discussion of a eulogy, I put away my pen and paper. I will write it down later in the car soon after I depart the house of mourning. The writing afterward is the analysis and synthesis of the teaching, in this case of learning the events, circumstances and essence of one person whose life is now complete. One gains the knowledge of relationships, of human success and folly, of history and philosophy. This is knowledge that novelists attempt to capture in words and this is their most powerful method for capturing the emotional turmoil of their characters. They listen.